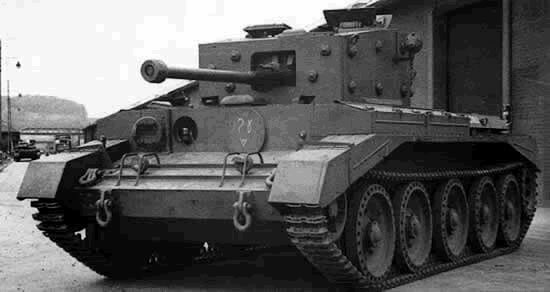 The British Mark VII Cavalier Cruiser Tank aka A24, was another in the series of Cruiser Tanks built in the UK for the requirements of the British Army during World War 2. The requirements for the Cavalier was a more heavier armoured tank in the 24 tonnes range that could be fitted with the British 6pndr (57mm) main gun. Developed and built in 1941 by the British Nuffield Company, the War Office placed an order for 500 vehicles before the vehicle had even been trialled. The vehicle was built from existing mechanical components used in other Cruiser tanks which had been proven to have a number of problems and thus were transferred to the Cavalier only to be exacerbated due to the increase of weight of the new vehicle compared to the older lighter Cruiser Tanks. The tanks ended up being used for training by British crews and in 1943 about 200 were converted in to other roles and it was these that participated in the North African Campaign of World War 2.